Whip used on sled dogs. Photo attributed to Wikimedia. Send tweets to Iditarod sponsors! 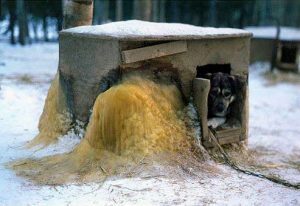 Iditarod dog shelter covered with dog’s frozen pee. Ugly Truths About "Father of Iditarod"
At least 154 dogs have been run to death or have died from other causes in the Iditarod. There is no official count of dog deaths available. 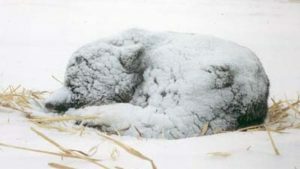 The Sled Dog Action Coalition does not raise money and does not accept funds. Its efforts are completely volunteer-based. Copyright © 2019 Sled Dog Action Coalition. All Rights Reserved.